The behavior of my backyard birds is often just as telling as the latest weather report. Judging from the frenzy of activity going on at the bird feeders today, the thermometer must be headed for negative numbers again. 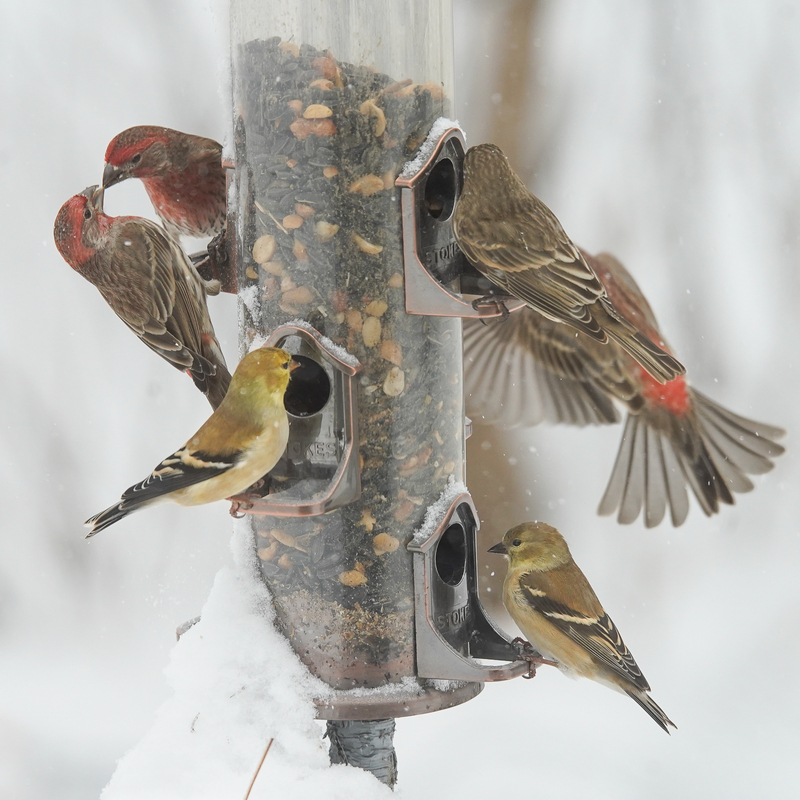 There must have been 2 or 3 dozen House Finches and Goldfinches mobbing this feeder in waves. Most of the time the birds took turns amicably. But there’s always a bully in the bunch. 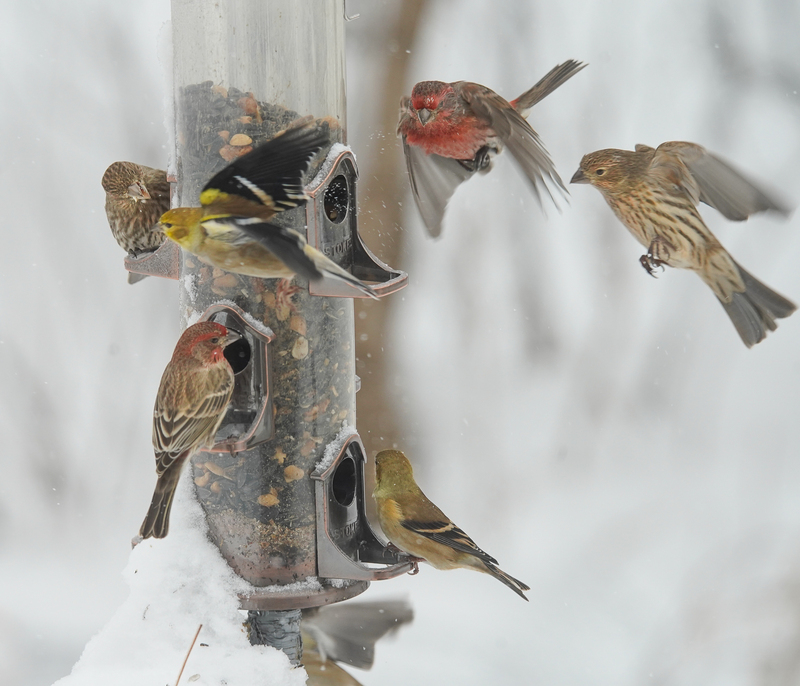 The red-headed male House Finch at top right tried moving a female House Finch off her perch. But she beaked him once or twice and he moved away. Moments later, he was over on the left side of the feeder trying to move a male House Finch away from his perch. But he lost that battle, too, and flew away. I never realized how pretty Goldfinches are in flight with their striking black and gold wings. 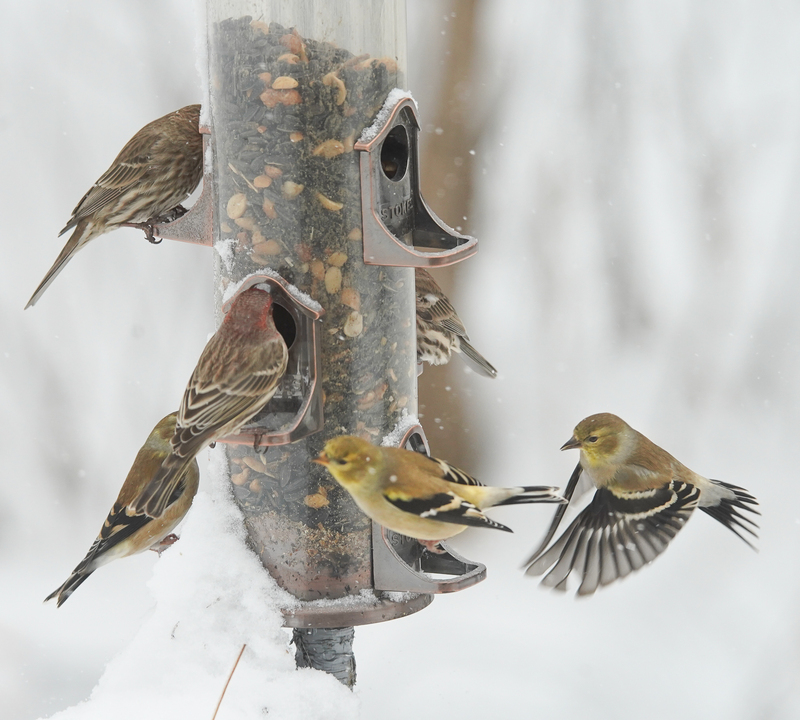 The finches monopolized the feeder continuously for 10-15 minutes and then disappeared for an hour or two. Then the frenzy started up once more, but again dissipated. It must take quite a while to move all that bird seed from their crop and stomach into the lower part of the intestine for digestion. 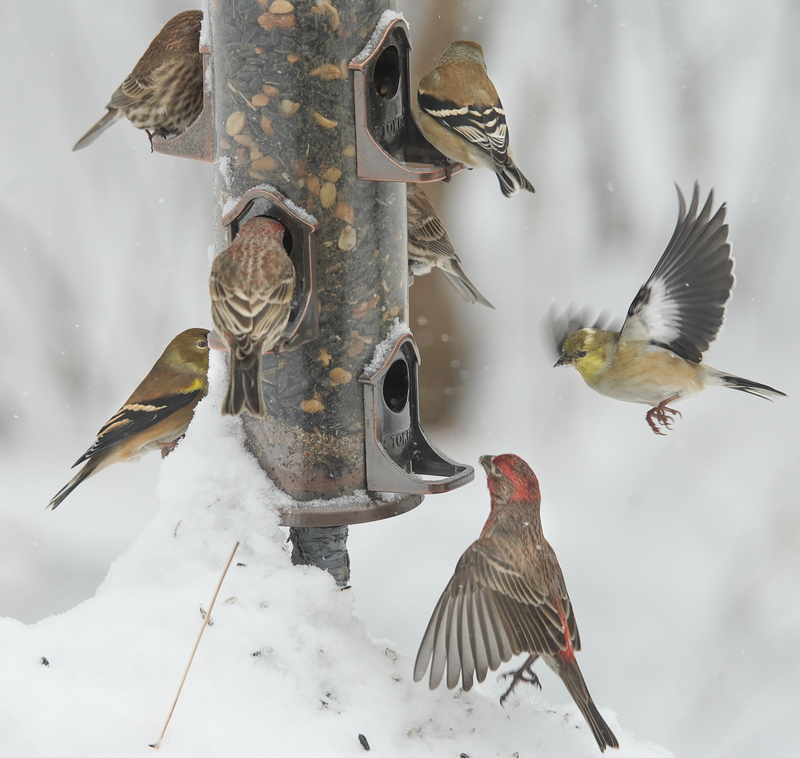 This entry was posted in Behavior, Birds, Minnesota wildlife, Wildlife Photography, winter and tagged American Goldfinch, feeding frenzy, house finch by Sue. Bookmark the permalink. 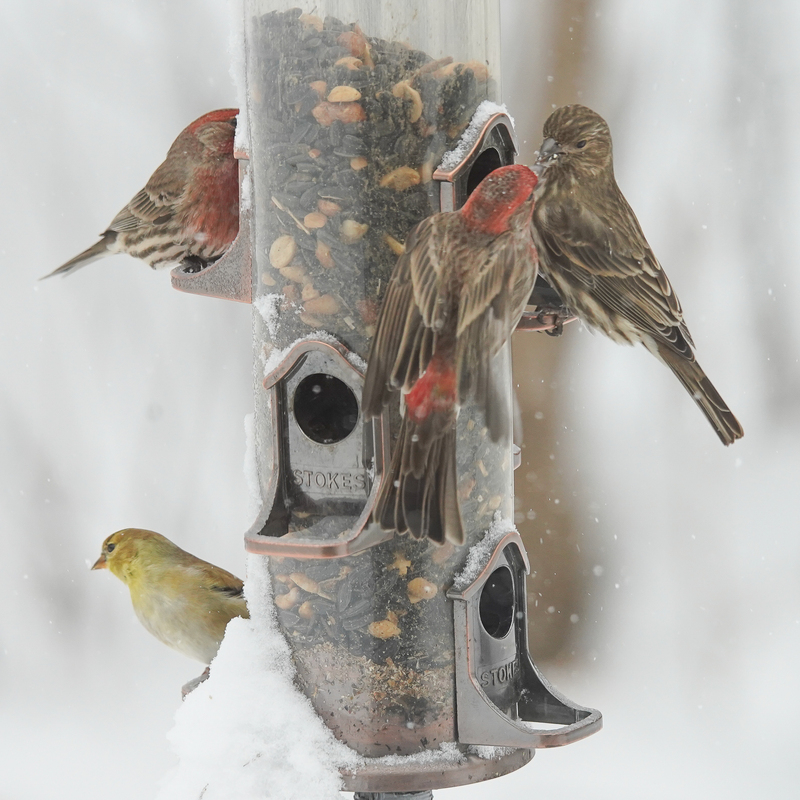 Marvelous photos & fascinating finch feast, Sue (to illiterate – irresistibly). I hope the wannabe tough guy came back in a quieter moment & fortified himself against the coming return of deep cold. He’ll need fuel to keep all his little fires lit. What beautiful birds finches are & so welcome in our yards. Thanks for your great comments! Not sure about Mr. Tough guy; they all look alike to me (haha). I have seen this same thing time and again! Finches especially are stress eaters! 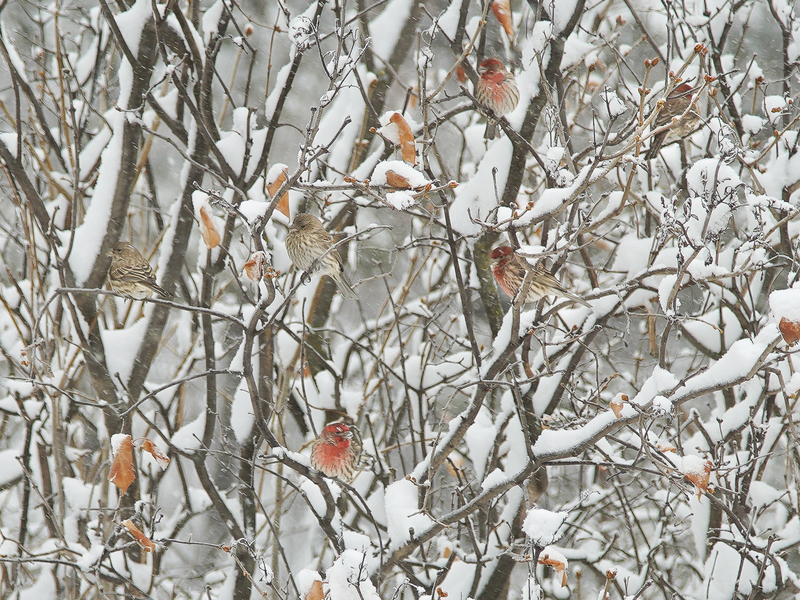 And no lie…once my birds were acting so crazy that I went and picked my kids up early from school, and made it home right before a freak ice and snow storm! Note: This morning’s temp is -10 F, with wind making it effectively -30. No birds at the feeder! Those little bird thermometers should win a weather forecasting award. I really like the photos of the frenzy. You can just hear the commotion and feel the chill.